Sky Valet announces the acquisition of "Gestair FBO", a Spanish comprehensive ground handling network specialising in business aviation. Sky Valet, an FBO brand specialising in ground handling services for business aviation at the Aéroports de la Côte d'Azur Group, announces the acquisition of 100% of "Gestair FBO", Handling Company belonging to the Gestair Group. Sky Valet thus becomes a European player independent of all business aviation operators. Established at Cannes Mandelieu, Saint-Tropez and Paris-Le Bourget, Sky Valet is distinguished by its position in ground handling in high-end business aviation and its commitment to the continuous improvement of its services and operations. With over 37 years' experience, "Gestair FBO", the former ground handling subsidiary of Gestair SA, the leader in the management of private business aircraft, manages the most extensive service network in Spain. The company offers a full range of premium ground handling services to passengers, crew members and aircraft at Madrid, Barcelona, Palma de Mallorca, Ibiza, Girona, Valencia, La Coruña and Santiago de Compostela airports. These services are coordinated via a 24/7 operations centre based in Madrid. This acquisition is part of Sky Valet's development strategy to internationalise and establish a pan-European FBO network in flagship territories. To enhance the quality and excellence of the organisation and the services provided, ensuring an optimal level of security and customer satisfaction, Sky Valet is committed to the generalisation of the IS-BAH (International Standard for Business Aircraft Handling) standard throughout its network. This determined certification approach to ground handling upholds best practices in the areas of service, security and the environment. Dominique Thillaud, Chairman of the Management Board of Aéroports de la Côte d’Azur Group and of Sky Valet , comments: "The acquisition of "Gestair FBO" fully meets the development objectives of the Sky Valet network, given its leadership and prestige on the Spanish market, the quality of its infrastructure, the high level of professionalism and the proactive attitude of its staff for the continuous improvement of high quality services. We are also delighted to welcome the staff of "Gestair FBO" whose professionalism has been proven". Michel Tohane, Director of the General Aviation Business Unit of Aéroports de la Côte d’Azur Group Unit , states : "We are delighted with the acquisition of this unique network in Spain, which complements our range of high-quality support services to business aviation. Our customers can rely on our professionalism at major airports, the strongholds of business aviation in Europe”. Jose Ramon Barriocanal, CEO of Gestair SA, adds: "This sale of "Gestair FBO" to Sky Valet will ensure very high quality services and offer access to a pan-European network, guaranteeing growth and continuous improvement on services to our Fleet”. The Aéroports de la Côte d'Azur Group was supported for this acquisition by Wagram Corporate Finance as its financial adviser and the Lacourte Raquin Tatar and JA Cremades y Asociados firms as legal advisers. 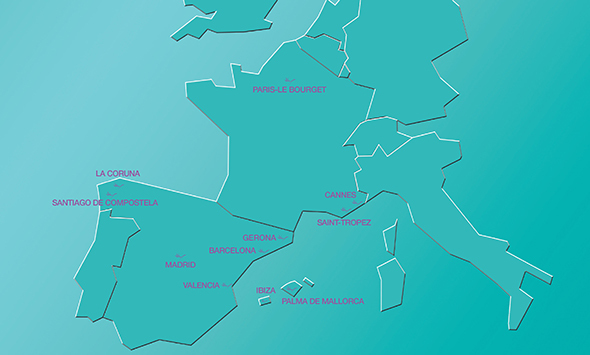 Sky Valet Europe- The exclusive FBO (Fixed Base Operator) brand of Cannes Mandelieu and Golfe de Saint-Tropez airports, launched at EBACE 2014, is now present at Paris-Le Bourget and throughout Spain. This strategic development ranks it as one of the leading FBOs in Europe in terms of quality of service and scope of its network.